Innovative education: Education for people with disability; professional training, STI policy cooperation. The University held a role acceptance speech ceremony with 13 of the 15 recently promoted Associate Professors from School of Education, School of Engineering and School of Science. 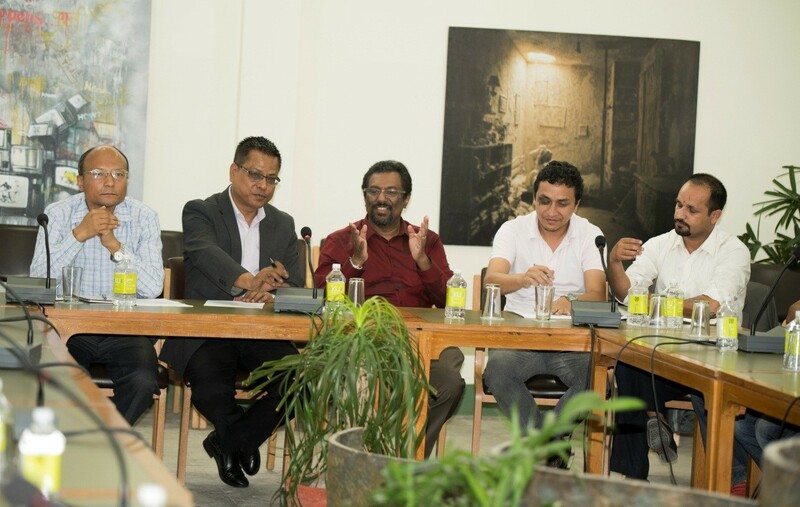 The Associate Professors to speak at the occasion were Dr. Prakash Chandra Bhattarai and Dr. Dhanapati Subedi from School of Education; Dr. Bal Krishna Bal, Dr. Rajendra Joshi, Dr. Hem Raj Kafle, Dr. Purushottam Kharel, Dr. Sunil Prasad Lohani, Dr. Gajendra Sharma and Dr. Surendra Bahadur Tamrakar from School of Engineering; and Dr. Uttam Budhathoki, Dr. Rajendra Gyawali, Dr. Rajani Shakya and Dr. Bhupal Govinda Shrestha from School of Science. The speakers summarized their personal and academic journeys and delineated their ongoing and future commitments to the programs and departments to which they are attached. Extending best wishes and congratulations on their promotions, Prof. Dr. Ram Kantha Makaju Shrestha, the Vice Chancellor, invited the Associate Professorsof to join hands in fulfilling the mission and vision of the University. He stressed that the University has run with the ideal of transperancy in all aspects and will live up to this ideal forever. Likewise, Prof. Dr. Bhola Thapa, the Registrar, expressed delight at the fact that the University now has a good number of senior faculties in different disciplines, and that the team has grown stronger towards taking the institution to a greater height. The program also included musical ensembles by third and fourth year students of the Department of Music, School of Arts. Among other members of the University family who attended the program were Prof. Dr. Sitaram Adhikary, founding Registrar; Prof. Dr. Panna Thapa, Controller of Examinations; Deans of different Schools; Professors, Associate Professors and Assistant Professors; Heads and Coordinators of different Departments; Managers, Officers and a number of other non-teaching staffs. The program of Acceptance Speech by newly promoted Professors from all the Schools, and Associate Professors from School of Arts and School of Management will be held in July. 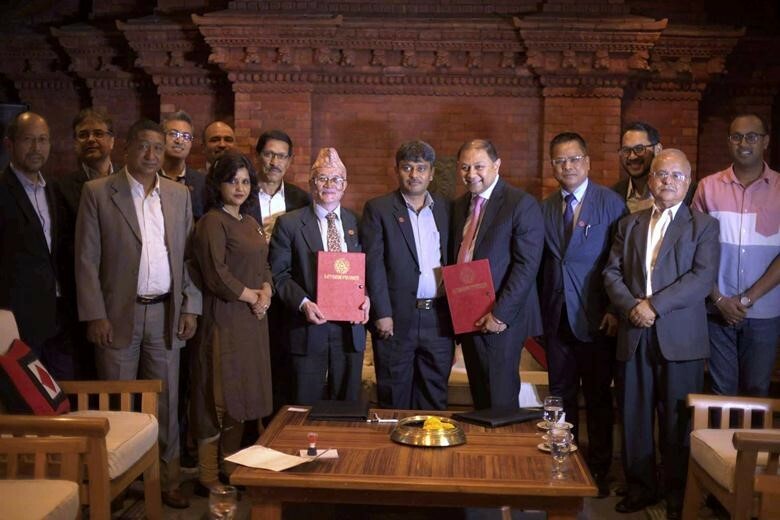 MoU Signed between Kathmandu University and Ncell Pvt. 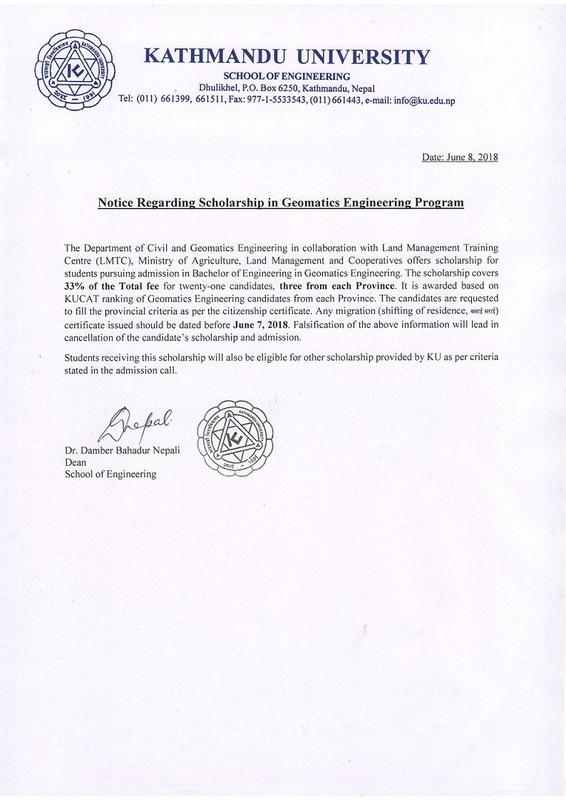 Ltd.
A Memorandum of Understanding (MoU) was signed between Kathmandu University and Ncell Private Limited on 14th June 2018 for the purpose of collaboration with US Boston based Massachusetts Institute of Technology, MIT Global Startup Labs to foster technology entrepreneurship for University students and young professionals of Nepal. The MoU was signed by Dr. Dambar Bhadur Nepali, Dean of School of Engineering KU, and Mr Suren Jeevaka Amaraekera, MD, NCell. 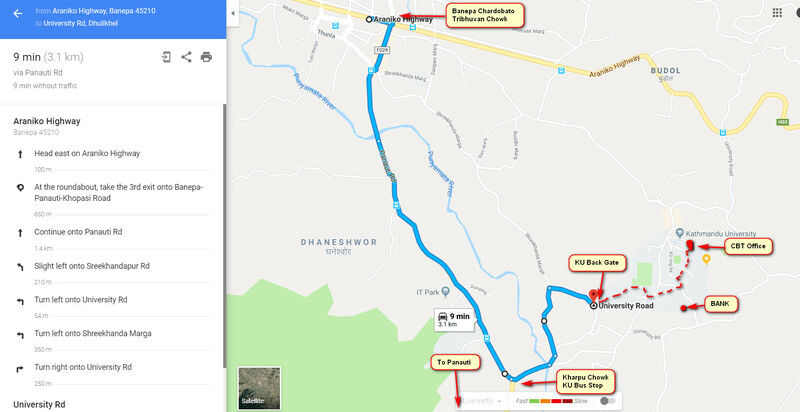 The program was also attended by Prof. Dr. Bhola Thapa, Registrar, Prof. Dr. Bijaya KC, Dean of KUSOM, Mr. Rupesh Krishna Shrestha, faculty at KUSOM. 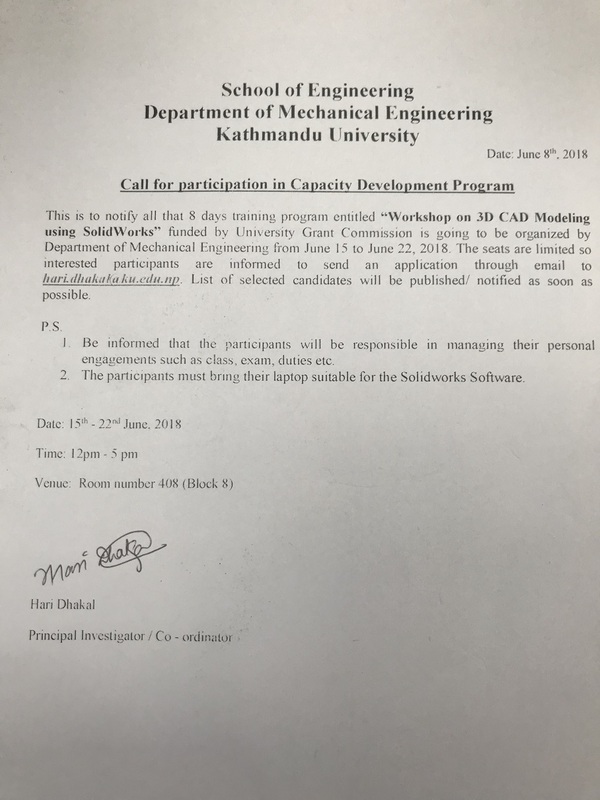 The event was coordinated by Prof. Dr. Bim Prasad Shrestha and Ms. Marina KC at Global Engagement Office of Kathmandu University central campus and Mr. Irwin M. Eusoff and Ms. Sanju Koirala from NCell Pvt Ltd. This program will provide exposure to KU students on “technopreneurship/business startup” by partnering with Massachusetts Institute of Technology (MIT), USA. The objective and goals of the MoU is to support skilled human resource development by assisting advanced technical education, global exposure and training for 35 KU students from Management, Engineering, Science and Arts background for a period of 7 (seven) weeks on “technoentrepreneurship” / business start-up by MIT-Global Startup Lab instructors, access to qualified, experienced MIT student instructors in technical and entrepreneurship field - key leanings on techno-preneurship and agile product development during the 7 weeks program. 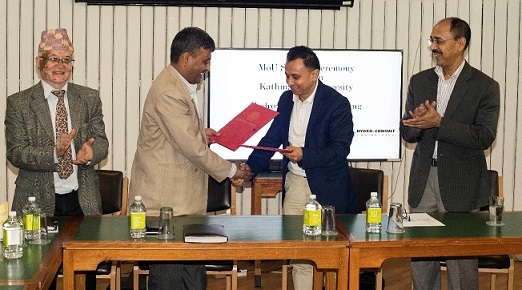 Talk program on "MIT Computer Science - Innovating the Future"
Memorandum of Understanding (MoU) has been signed between Kathmandu University (KU) and Hydro- Consult Engineering Limited (HCEL) on 18th June, 2018 as per KU’s strategy to cooperate with the industrial sectors. Areas of co-operation between the parties will be focused but not limited to Civil, Mechanical, Electrical and Environmental aspects of hydropower sector. Dr. Bibhuti Ranjan Jha and Dr Smriti Gurung from Department of Environmental Science & Engineering (DESE), and their research team have got a new journal article entitled "Patterns of diversity and conservation status of freshwater fishes in the glacial fed and rain fed rivers of Eastern Nepal" published in the Journal Environmental Biology of Fish (Springer Nature). The short-listed papers presented in the International Symposium on Current Research in Hydraulic Turbines (CRHT) –VIII organized by Turbine Testing Lab (TTL) on 20th March 2018 in Kathmandu University have now been published in IOP-Journal of Physics-Conference Series. Following is the link to the published papers. In this symposium, the technical session was represented by six Universities in three parallel sessions. In total, 24 papers were presented in the symposium, out of which 10 were selected for publication in IOP. The selection was based on the evaluation and thorough review process by respective session chairs and the organizing committee. All candidates willing to apply for Undergraduate programs of School of Science and School of Engineering should look over the following documentations before filling up online registration form and appearing to collect admit card. Note: Subsequent list /EOI for admission is published only if the seat is not filled from previous list; schedule may be adjusted. 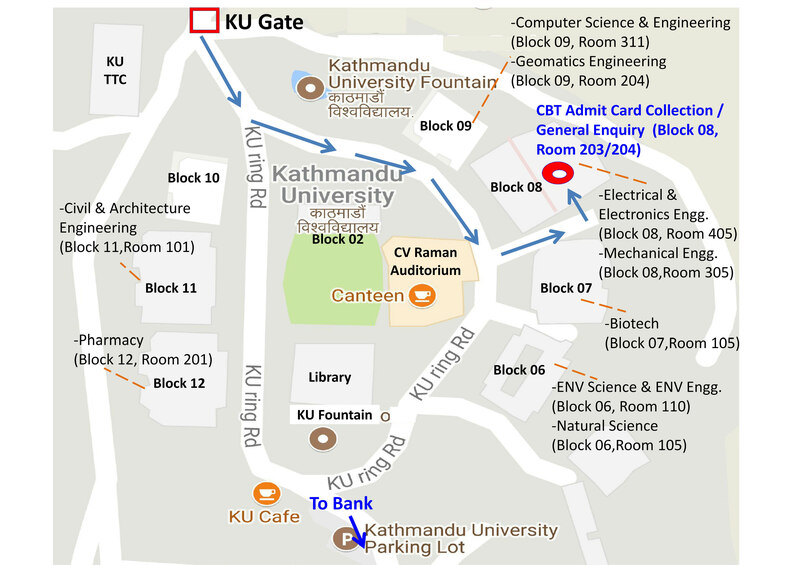 Any adjusted schedule will be notified in KU website. 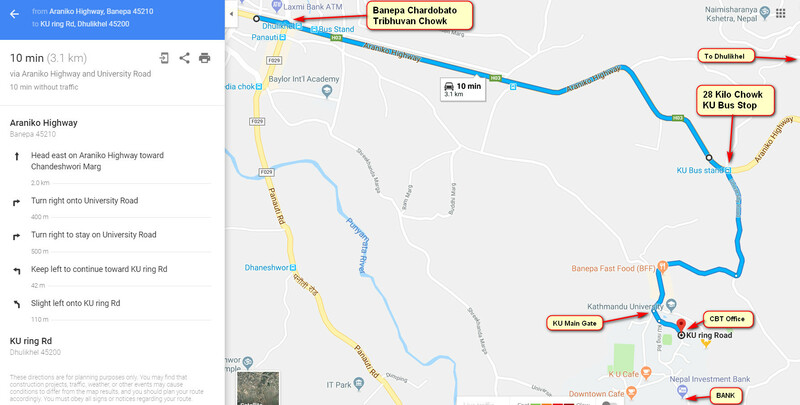 *For admit card issue for entrance test, personal identification (ORIGINAL) & its copy (citizenship or passport or license or 12/equivalent admit card or other valid photo ID issued by recognized authority from Nepal Government), 3 recent PP size photographs, and the bank deposit voucher (Rs. 1,500) are required. Application fee may be deposited in any one of the following bank accounts (Bank counter and ATM are also available in KU premises). Please visit Room No. 203 at Block 8 for Admit Card Collection and for general as well as CBT related enquiries. Visit respective department/school admin offices for counselling and course enquiries. Candidates are strongly advised to read thoroughly the KUCAT CBT Information and try CBT demo before appearing in the examination. 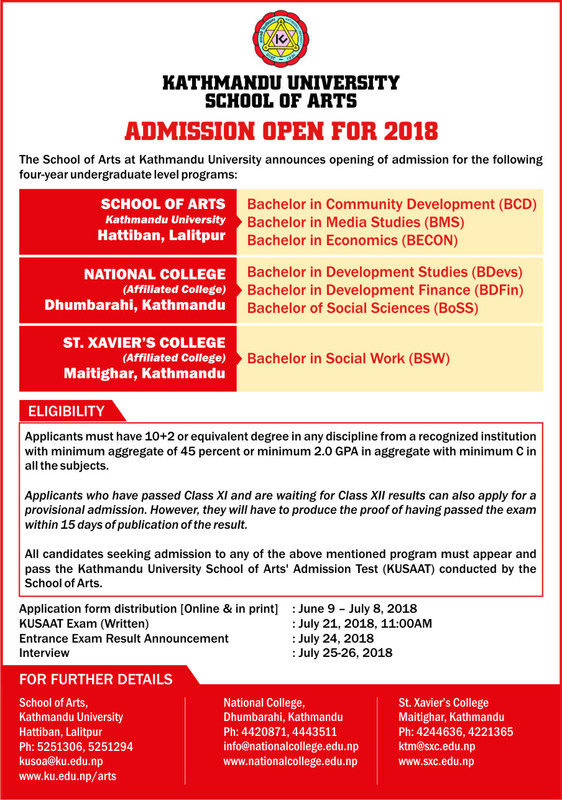 Please check our Admission page and Admission web portal for admission 2018 specific notices and information.